Greek Default Watch: How Much Does Greece Matter? 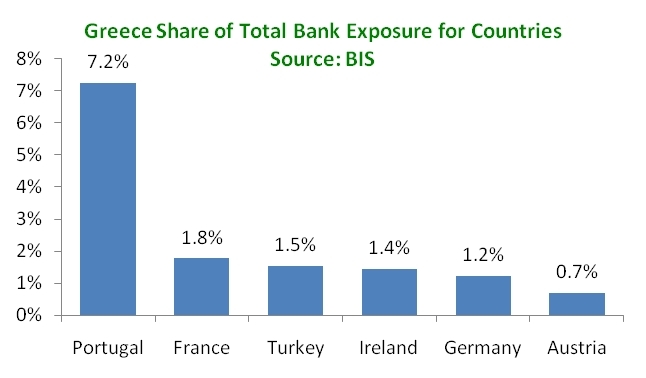 The Bank for International Settlements (BIS) just published its international banking statistics for Q2 2010, showing, among other things, the exposure that one country’s banks have on other countries. In June 2010, the 24 countries that report data had an ultimate exposure of $156 bn on the Greek economy – the majority of that exposure was to the non-bank private sector (50%), followed by the public sector (41%) and then banks. Over the past nine months, foreign banks have gradually unwound their positions on Greece. From a high of $297 bn in Q3 2009, foreign banks have reduced their exposure to Greece by some 50% or $141 bn. More than half of that decline came from Switzerland, which lowered its claims $78 bn to $3 bn between Q3 and Q4 2009. This reduction was part of a broader strategy by Swiss banks to shore up their balance sheets: between Q1 2008 and Q2 2010, Swiss banks lowered their foreign claims by 40% or $1 trillion. Besides Switzerland, the two countries most exposed to Greece are Germany and France, which together hold around 60% of the global claims on the Greek economy. Both countries, however, have reduced their exposure to Greece since Q3 2009: the French by $21.2 bn and the Germans by $6.4 bn. Still, these two countries stand to lose the most in the event of a Greek default. But how much do they stand to lose? The nominal amount they held in June 2010 – $94 bn – is significant. Yet that number is marginal in the overall portfolio of these countries’ banks. 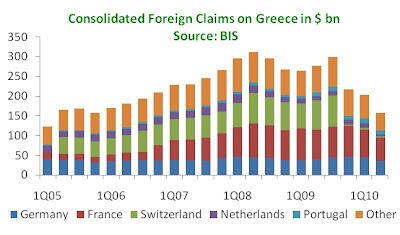 For France, claims on Greece represent some 1.8% of total global claims; for Germany, the number is 1.2%. Only for Portugal, which is the fourth largest holder of Greek liabilities, does a Greek default pose a serious problem since 7.2% of the total claims of Portuguese banks were on Greece. None of this is to suggest that default would not hurt these banks or these countries’ banking sectors. Given that capital adequacy requirements can easily swing if a few billion dollars worth of assets are impaired, an exposure of $156 bn is quite serious. Yet, it is quite clear that French and German banks are both reducing their exposure to Greece (the French a lot more so) and that as a result, the impact of a possible Greek default on their balance sheets becomes progressively smaller. 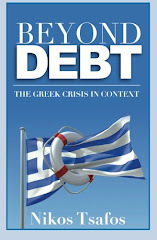 "the impact of a possible Greek default on their balance sheets becomes progressively smaller." Yes and no. The losses will be calculated based on the % they have deposited at the ECB. Since Germany's and France's share at the ECB is lower than their respective banks' share of the Greek debt, they want to move the Greek bonds to the ECB (essentially no one else is buying). The con side is that Greece will piss off every ECB member, as supposed to just a few top ones. Many of them are in a disastrous economic state for themselves so you understand if Greece causes them to lose a billions and billions.